But thems the orders in the Brent and Camden branch, where the online campaign tactic seems to be to try and slap election material on the FB pages of all of your favourite bars. 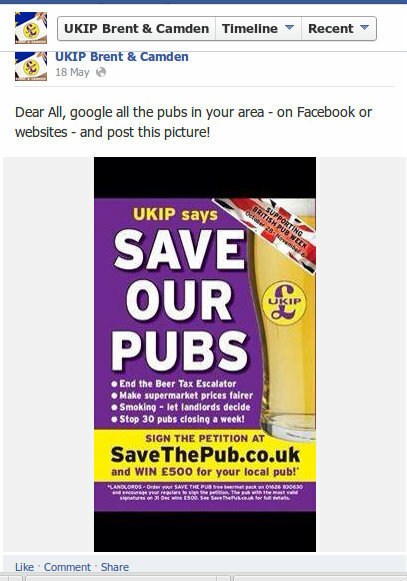 If punters are not convinced by the need to campaign for less pub closures through UKIP, there is a WIN a £500 bar tab tempter to join their cry. Not such a denting spend by the party, however, in return for having purple and yellow messages spread across Facebook and a raft of contact details from the people who do click and sign.